Even as you bask in the sun on Whitby's sandy beaches, you cannot fail to be aware of the imposing and slightly sinister presence of the ruined Abbey, high on the East Cliff. Situated on the eastern edge of Whitby, the Abbey is accessed by climbing the 199 stone steps that lead from the end of Church Street. These steps were originally wooden, and were built to allow coffin-bearers to reach the church. To this day there are coffin rests and seats along the stairs to allow weary limbs to rest. The present-day Abbey ruins date back to 1078, when the Normans built a Benedictine Priory on the site, replacing the ruins of the original monastery which was sacked by Vikings in 867. The Abbey is steeped in history, both religious and otherwise - the nearby graveyard of St Mary's Church is reputed to have been the haunt of Count Dracula, and the legend that has built up around this story has led to Whitby becoming a popular destination for gothic enthusiasts, particularly during the biannual gothic music weekends. The monastery was originally home to both nuns and monks, amongst whose number was Caedmon, reputed to be the first English poet and the father of sacred song. He was recruited to the abbey at Streoneshalh, as Whitby was then known, by Saint Hilda herself after she had heard him sing. Today, the significance of Caedmon's work is recognised with a large and ornately decorated gothic cross in the graveyard of St Mary's Church. 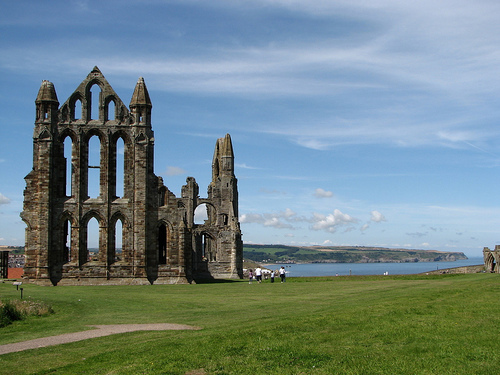 The abbey's importance as a regional centre became apparent when the Synod of Whitby was held there in 664, but its political power was to be fairly short-lived as in 867 Vikings landed in the area and ransacked the monastery. At the time, Danish settlements were spreading along the east coast of England, and it is thought that the Danes went on to settle in Whitby for some years after their arrival in 867. The abbey was re-founded as a Benedictine Priory around 1078, in the aftermath of the Norman Conquest. Again, it was home to both nuns and monks, and remained on the site for nearly 500 years, until the brutal policies of King Henry VIII forced its final closure and partial destruction as part of the Dissolution of the Monasteries in 1539. St Hilda's Abbey was then allowed to fall into disrepair, inadvertently becoming a source of stone for local residents, but today the remains are administered and maintained by English Heritage, and the unmistakeable profile of the abbey's ruins against the skyline is visible from many miles away when driving towards Whitby. Dating from 1110, St Mary's Church was originally built to provide a place of worship for the workers serving the Abbey, who were not allowed to worship within the Abbey itself. Although it has been extended several times, the original church still remains and is still the parish church of Whitby today. Inside St Mary's Church, there are several notable design features - including a triple-decker pulpit, built to ensure the whole congregation could hear the sermon being read. Other notable features include the original 17th century box pews, which were originally hired by families for their exclusive use, and the extraordinary Cholmley pew, built in front of the chancel arch for this leading family so that they could have an unimpeded view of the service and the congregation. The Church also has an unusual upper gallery and still has an original Elizabethan altar table. St Mary's graveyard is well known to fans of Bram Stoker as the lurking place of Count Dracula, and at night the looming ruins of the nearby Abbey do indeed add a sinister and mysterious aspect to the area, leading one to think that fact could indeed be stranger than fiction. About the Author: Alan Moore invites you to join his free email newsletter, The Whitby Bite: http://www.dracula-in-whitby.com/whitby-bite.html, where you can learn more about the real Dracula and his connection to Whitby, Yorkshire's unique vampire town.